You don’t have to be a fan of Edward Tufte‘s marvellous books on charts and visualisation to like timelines, nor to want a better way of building them. Much of what we write about can usefully be cast in time sequence, and there is often nothing as helpful as a well-drawn timeline. Drawing timelines from scratch is time-consuming and tedious. You will get exactly what you want, but getting there is often a slow process. Worse, if you want to create several linked timelines, or add data and adornments such as images, you can find yourself repeating tedious tasks far more than you ought. If you are already working in either of Eastgate Systems’ superb tools, Tinderbox or Storyspace, you have no excuse for tedious tasks: their Timeline views are among their many strengths. 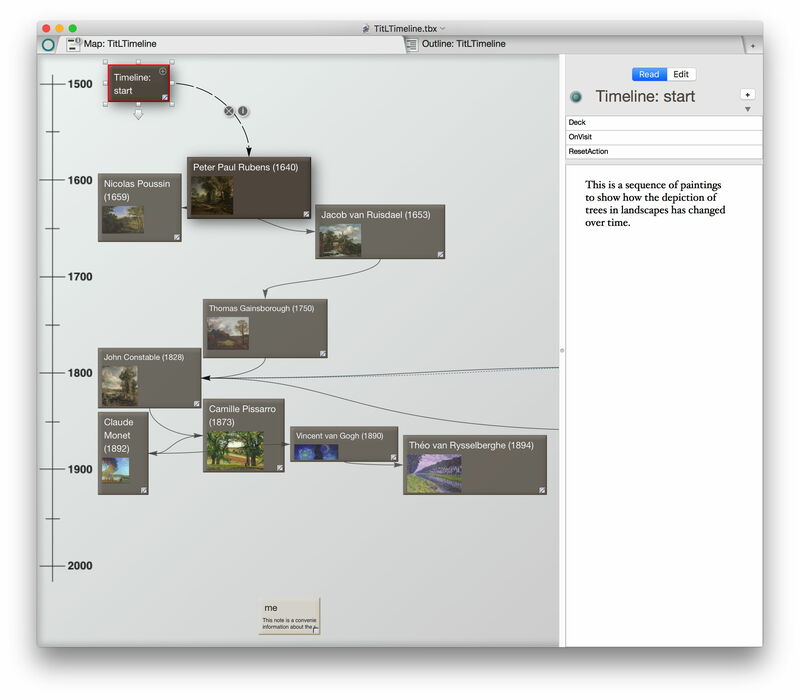 I have shown two routes to generate high quality timelines in Storyspace here and here. 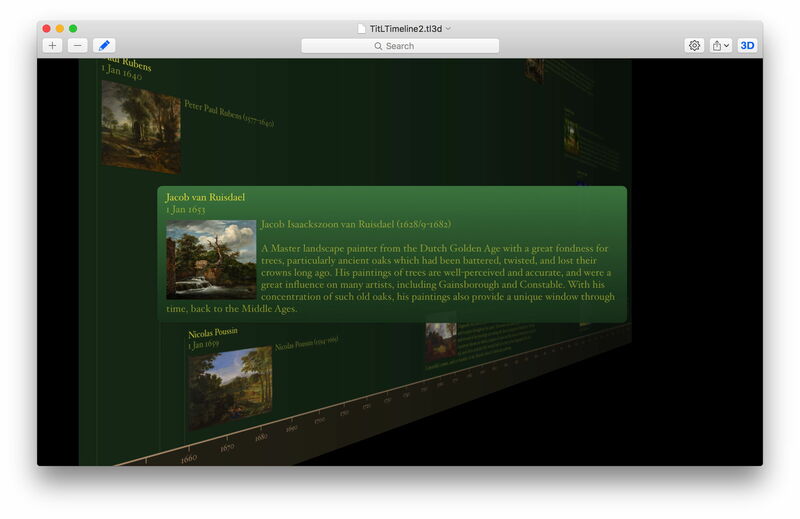 If you need high quality printed output, web pages, or something else, and don’t fancy either of those, there is another option in the Mac App Store: Timeline 3D, which is free, with its export tools as in-app purchases. 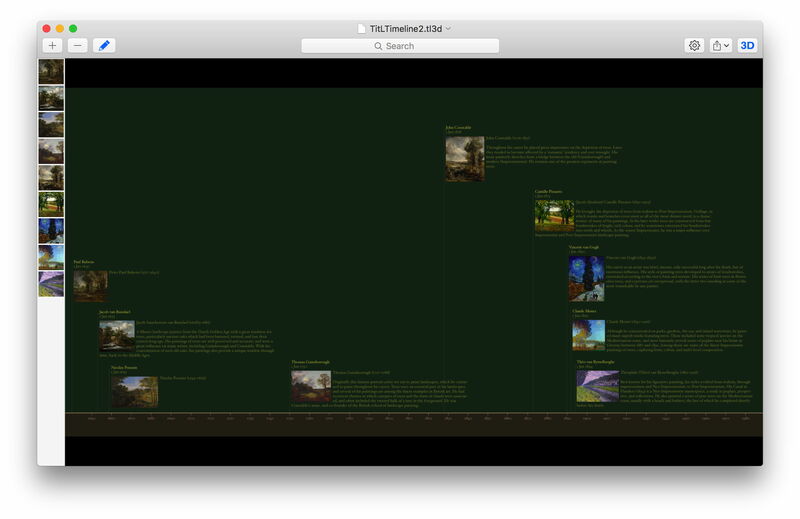 Entering the information for each point along the timeline is quick and simple, and there is excellent support for adding an image and text. Simply click the + button at the top left to add another point, then step through the data fields which you wish to use. Once you’re ready, click on the cog tool at the top right to configure appearance, then on the 3D button to generate the timeline itself. The app then takes a few seconds to display your data on its auto-scaled timeline. Click on any of the individual entries and it zooms in and displays its detail. 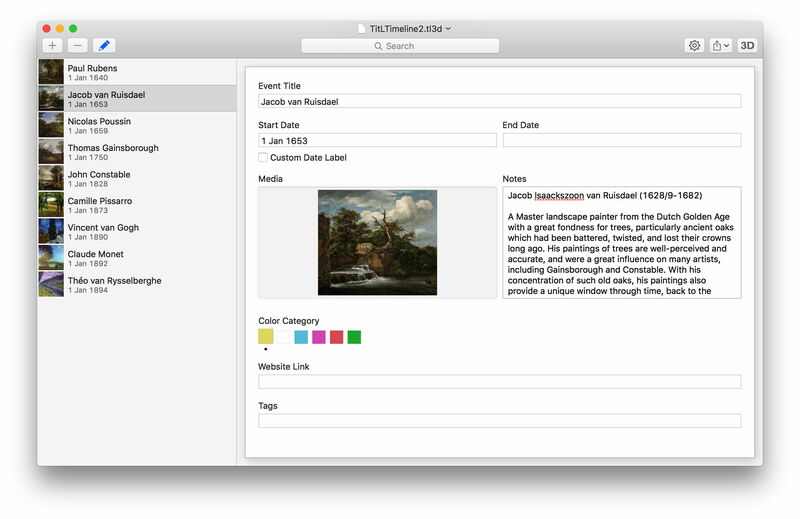 If you want to export completed timelines, separate purchases add the ability to print and export to PDF, to export PPTX slideshows, high-def movies, and WebGL websites. Each is £6.99, or you can unlock the lot for £18.99. If you use other tools for producing timelines, and can recommend them, please comment or email me with details. 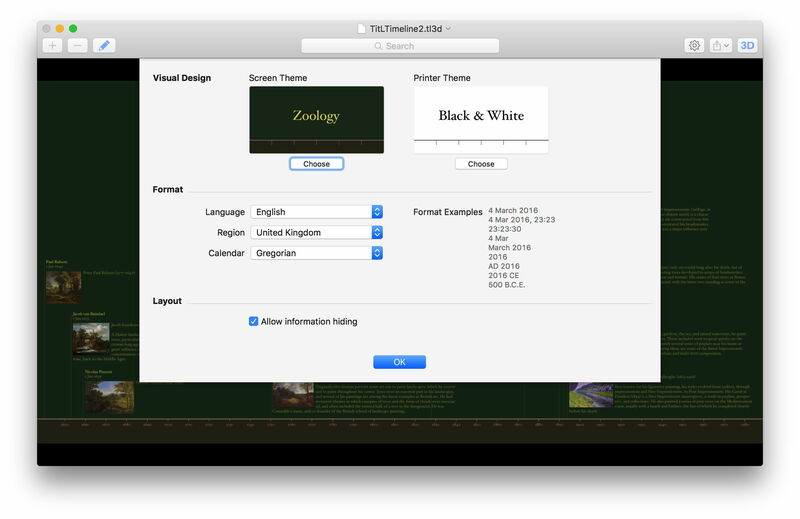 Posted in General, Macs, Painting, Technology and tagged charting, Storyspace, Timeline, Timeline 3D, Tinderbox, Tufte. Bookmark the permalink.